Led by Professor Hassan Ugail, the team mapped 49 landmarks on the face, mainly around the eyes, mouth and down the nose. They used these to assess how the face changes as we smile caused by the underlying muscle movements - including both changes in distances between the different points and the 'flow' of the smile: how much, how far and how fast the different points on the face moved as the smile was formed. "We used a fairly simple machine classification for this research as we were just testing the concept, but more sophisticated AI would improve the recognition rates," said Professor Ugail. The underlying purpose of this research is more about trying to enhance machine learning capabilities, but it has raised a number of intriguing questions that the team hopes to investigate in future projects. 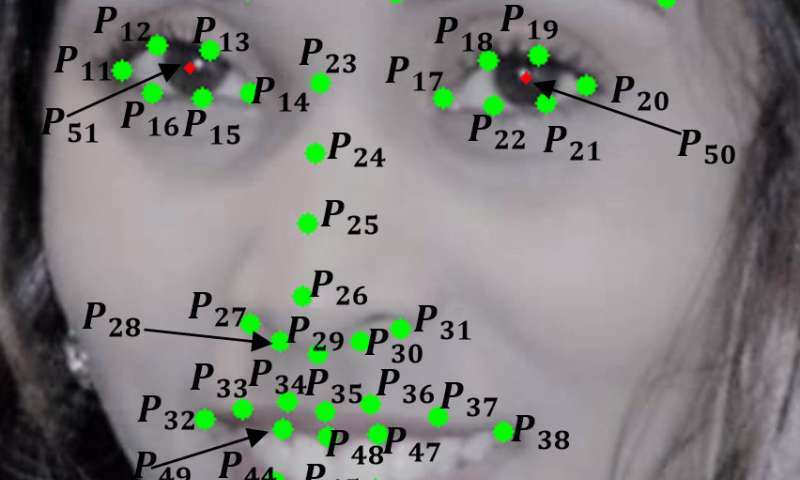 "Because this system measures the underlying muscle movement of the face during a smile, we believe these dynamics will remain the same even if external physical features change, following surgery for example," said Professor Ugail. "This kind of facial recognition could become a next- generation biometric, as it's not dependent on one feature, but on a dynamic that's unique to an individual and would be very difficult to mimic or alter."